MSRP or Price does not include $660 in destination charges. The first secret of getting away from it all is to go where most people can’t. 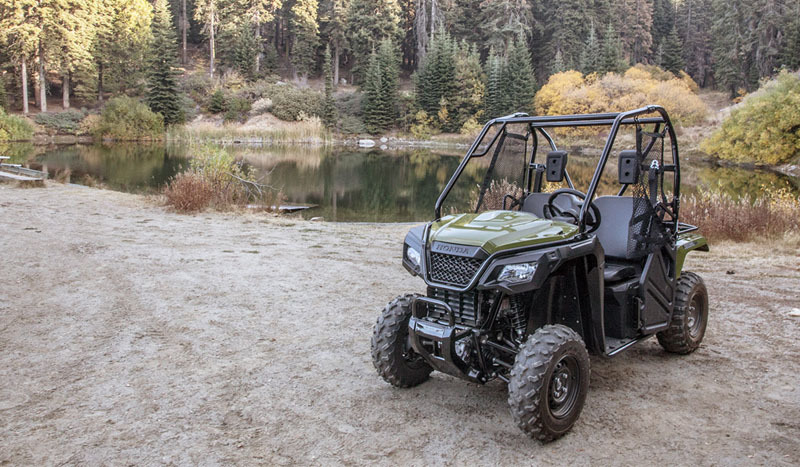 That’s where a Honda Pioneer side-by-side comes in. The second secret? To go where other side-by-sides can’t. And that’s where the Pioneer 500 truly rocks. It comfortably seats two, and is only 50” wide so you can explore trails with width restrictions. Plus, it fits in a full-sized pickup’s bed and has lots of great features like automatic transmission with AT/MT modes. And for 2019, check out our expanded lineup of color options. Work or fun, the Pioneer 500 gets the job done. SIDE-BY-SIDE SEATING: With a comfortable bench-style seat, individual backrests and seatbelts for both rider and passenger, the Pioneer 500 offers side-by-side comfort and excellent maneuverability. INDEPENDENT REAR SUSPENSION (IRS): The Pioneer 500’s fully independent rear suspension means you get a smooth ride, especially over rough terrain. 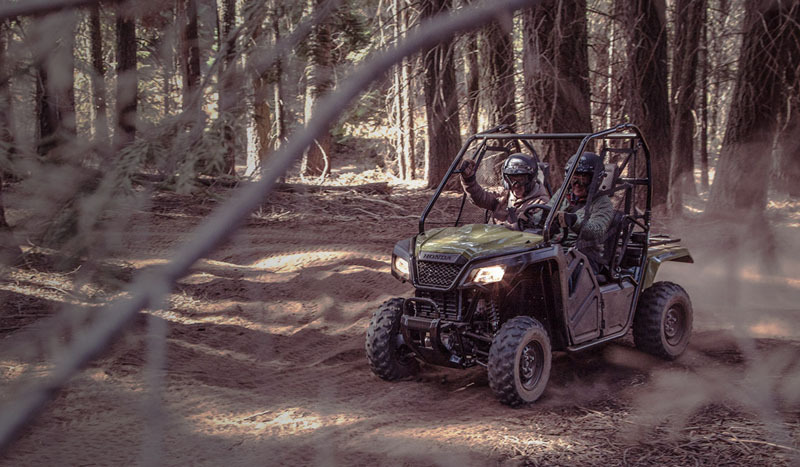 FUN, SPORTY RIDE: With 5.9 inches of travel at the front wheels and 8.5 inches of ground clearance, the Pioneer 500 can negotiate rough trails with ease. 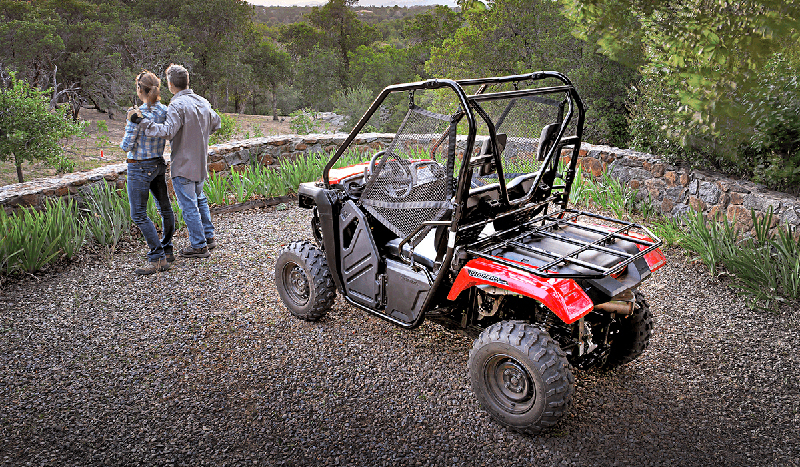 And the Pioneer 500’s suspension is tuned for a fun, sporty ride too. 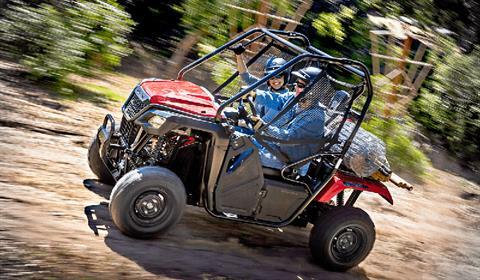 AUTOMATIC TRANSMISSION WITH AT/MT MODE: You can let the Honda Pioneer 500’s automatic transmission shift for you, or you can still shift yourself with its paddle shifters. You can even shift from auto to manual (AT to MT) on the fly! DUAL RATE SPRINGS: A spring is a spring, right? 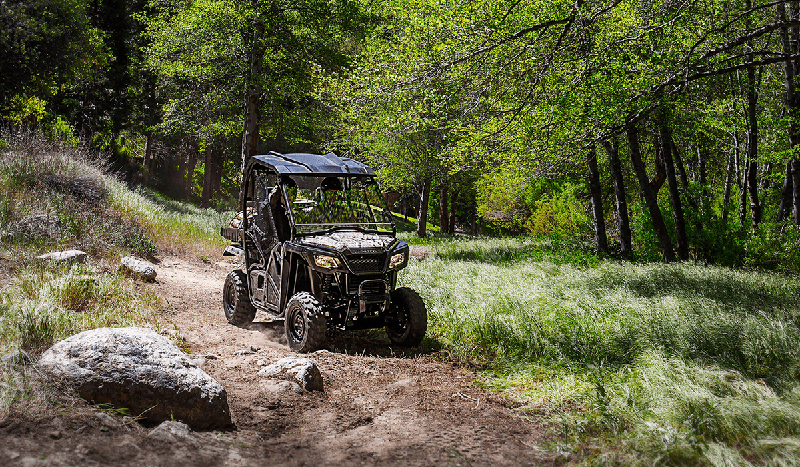 Sure, all springs may look alike, but the Pioneer 500s feature dual-rate springs, and after one ride you’ll feel the difference. 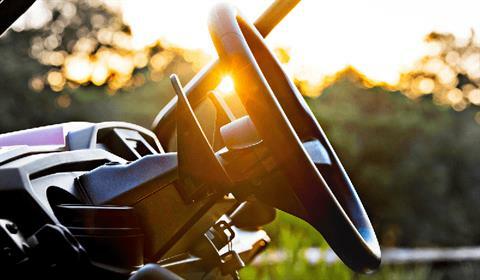 You get a smoother ride over smaller bumps with more bottoming resistance on bigger bumps, along with a more confident steering feel. STRONG GEARBOX: Unlike the belt-drive automatics out there, the Pioneer 500 features an AT/MT mode transmission that uses rugged, steel gears. You get true compression braking for superior controllability (especially when descending hills), as well as long transmission life. 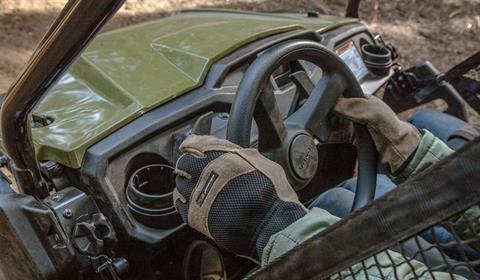 TRAXLOK 2WD / 4WD: Our rock-solid system lets you choose either 2WD or 4WD, giving you the freedom to choose between lighter steering (in 2WD) and maximizing available traction (in 4WD) when you need it most. POWERFUL 500-CLASS ENGINE: Coupled with an efficient five-speed automatic transmission, the Pioneer 500’s engine features electronic fuel injection for effortless cold-weather and high-altitude operation. It’s specially tuned for low-rpm torque, too. 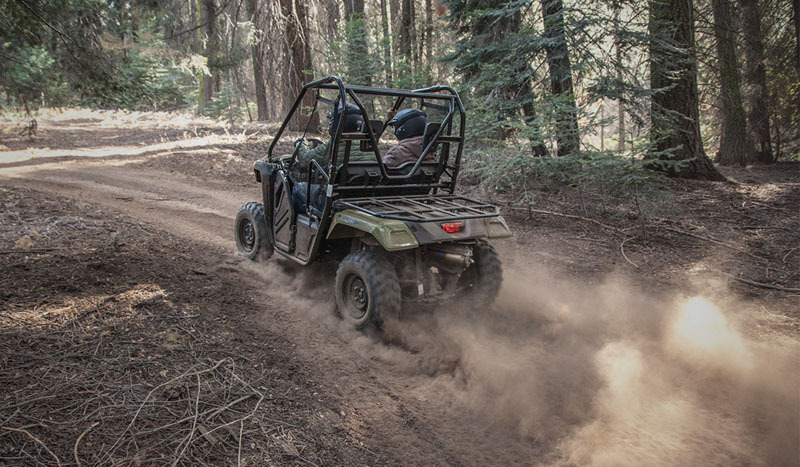 SEMI-DRY-SUMP ENGINE: Compact and lighter weight, the Pioneer 500’s overhead-valve, semi-dry-sump design creates an engine that's not only shorter from top to bottom, but one that enhances handling with a low center of gravity and favorable ground clearance. 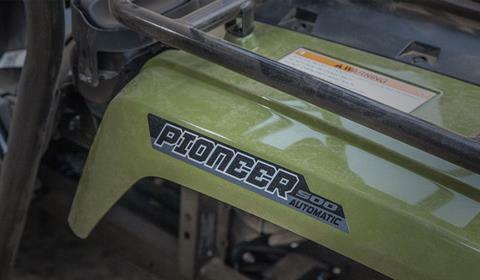 LONGITUDINAL ENGINE MOUNTING: The Pioneer 500 is built around our strong, single-cylinder, 475cc longitudinal engine. 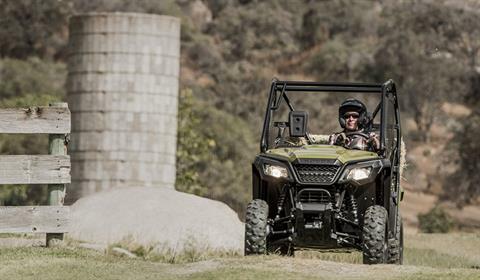 By orienting the crankshaft front to back in the chassis, we route the flow of power straight to the wheels without any right-angle detours, reducing powertrain friction and putting more grunt to the ground. LIQUID COOLING: Our time-tested Honda engine is liquid-cooled, which provides more consistent operating temperatures and more power than a comparable air-cooled motor. This adds up to better performance and longer engine life. 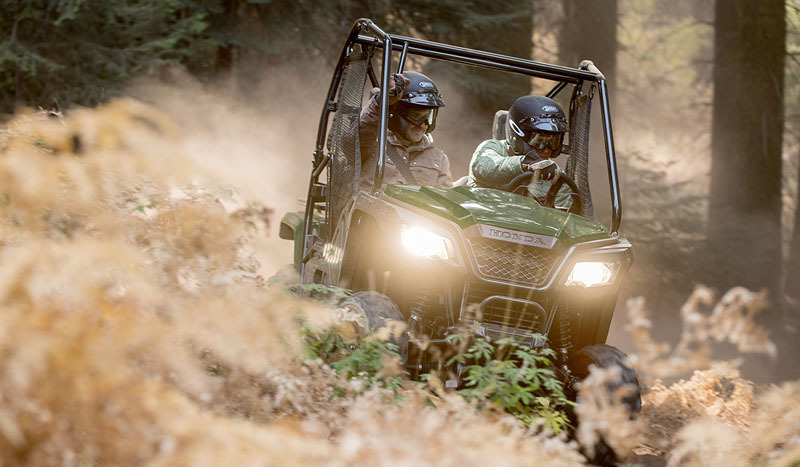 CLOSED-LOOP FUEL INJECTION: Better cold-weather and high-altitude running, effortless startups, great fuel efficiency and less pollution—that’s what the Pioneer 500’s “closed loop” fuel-injection system means for you. And that’s what we call a win/win situation. 1000 POUND TOWING CAPACITY: The Pioneer 500 has a heavy-duty receiver-style hitch and 1000-pound towing capacity. DRIVER / PASSENGER PROTECTION: The Pioneer 500 is loaded with features to help provide a feeling of security for the driver and passengers. The Occupant Protection Structure uses sturdy, large-diameter tubing, and includes integrated handholds, recessed top tubes and a more spacious structure to enhance protection; it also meets OSHA’s 1928.53 rollover protective structure standard. Hard doors and roll-up side nets provide a secure feel and keep mud and debris out of the cabin, while automotive-style three-point belts with an Emergency Locking Retractor mechanism help keep everyone secure. SINGLE-FUNCTION DOOR / NET: The Pioneer 500 comes standard with doors, and the occupant net is directly attached—just unlock and open the door, and the net automatically swings aside making entry and exit easier. COMPACT 50 IN. WIDTH: The Pioneer 500’s 50-inch overall width is a huge bonus. 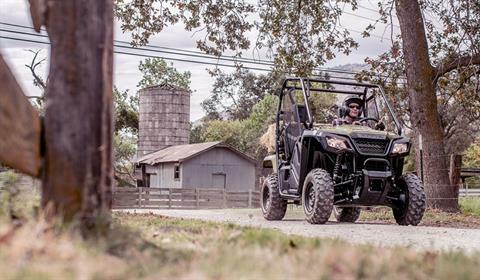 Whether it’s for width-restricted trails or convenient transportation and storage, the Pioneer 500 can go where just about no other side-by-side can! 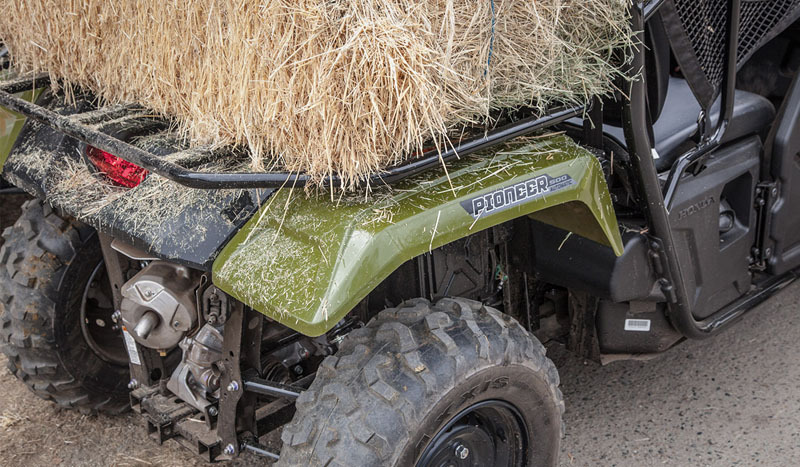 REAR CARRIER DESIGN: With the unique steel rear carrier design, the Pioneer 500 gives you tremendous versatility when it comes to securing loads. Special tiedown-hook securing points make it even easier, and the rack’s 450-pound rating gives you plenty of carrying capacity, too. Curb - 1,025 lb. - includes all standard equipment, required fluids and full tank of fuel. Five-speed automatic transmission with AT / MT modes with paddle shifting and reverse. Two drive modes include 2WD and 4WD. 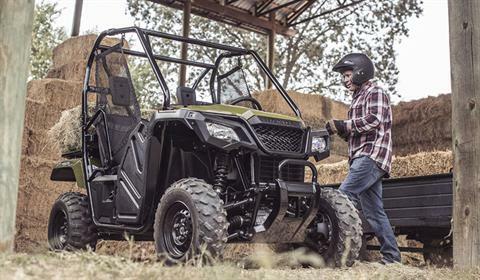 SxS / UTVs ARE ONLY FOR DRIVERS 16 YEARS OF AGE AND OLDER. 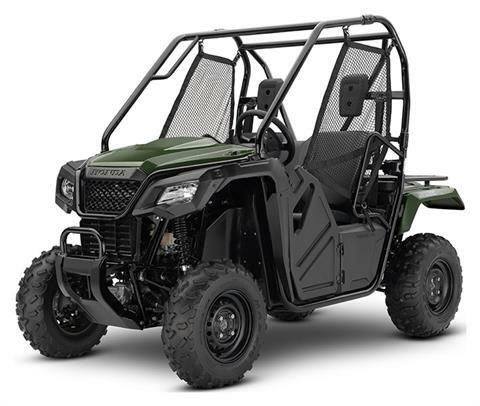 MULTI-PURPOSE UTILITY VEHICLES CAN BE HAZARDOUS TO OPERATE. FOR YOUR SAFETY, BE RESPONSIBLE. ALWAYS WEAR A HELMET, EYE PROTECTION AND APPROPRIATE CLOTHING. ALWAYS WEAR YOUR SEAT BELT, AND KEEP THE SIDE NETS AND DOORS CLOSED. 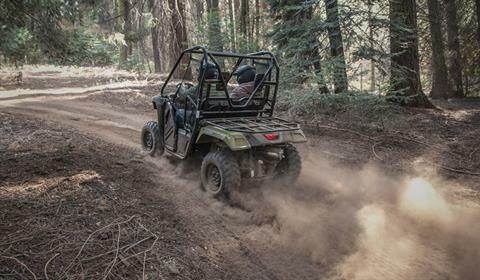 AVOID EXCESSIVE SPEEDS AND BE CAREFUL ON DIFFICULT TERRAIN. 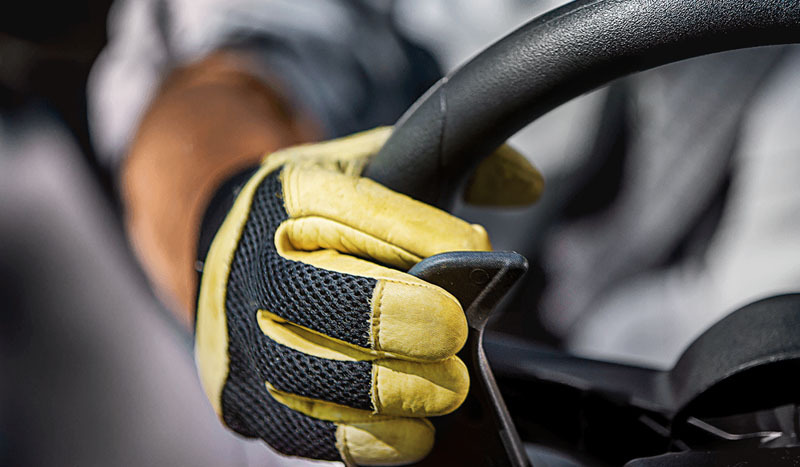 ALL MUV DRIVERS SHOULD WATCH THE SAFETY VIDEO "MULTIPURPOSE UTILITY VEHICLES: A GUIDE TO SAFE OPERATION" AND READ THE OWNER'S MANUAL BEFORE OPERATING THE VEHICLE. NEVER DRIVE UNDER THE INFLUENCE OF DRUGS OR ALCOHOL, ON PUBLIC ROADS OR WITH MORE THAN ONE PASSENGER. DRIVER AND PASSENGER MUST BE TALL ENOUGH FOR SEAT BELT TO FIT PROPERLY AND TO BRACE THEMSELVES WITH BOTH FEET FIRMLY ON THE FLOOR. PASSENGER MUST BE ABLE TO GRASP THE HAND HOLD WITH THE SEAT BELT ON AND BOTH FEET ON THE FLOOR. RESPECT THE ENVIRONMENT WHEN DRIVING. 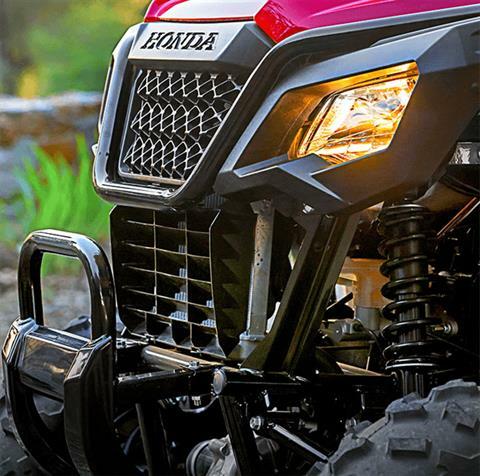 Pioneer is a registered trademark of Honda Motor Co., Ltd.